Check our compatibility guide if you want to know if Acrolinx for Outlook on Mac works with your local platform and with your Acrolinx platform. Acrolinx for Outlook works a little differently than other Acrolinx integrations. In Outlook, you get a lighter version of the Sidebar. The cards give you all the information you need to correct your content. But Acrolinx doesn't highlight issues in the text and doesn't replace issues for you. You can edit each issue directly in the text. All other Sidebar features work as you're used to. Acrolinx checks saved e-mails. You can either create a new e-mail and save it, or open a previously saved e-mail draft. How can I install, update or uninstall the Sidebar in my application? If you do the installation yourself, ask your Acrolinx administrator for the installer file. You might have it already, if you and the Acrolinx administrator are the same person. Open the Acrolinx DMG file. Move the Acrolinx icon to your Applications folder. Double-click the Acrolinx icon to start the Acrolinx for the first time. By default, you only need to start Acrolinx once after the installation. After that, Acrolinx automatically starts when you log in to your computer. We regularly release new versions of Acrolinx for Mac. Make sure you grab the latest version to enjoy new and enhanced features. Download the latest version of Acrolinx from your company download area. Before you run the Acrolinx DMG file, select Menu bar > Acrolinx > Quit Acrolinx to make sure that you have closed the outdated version. Open the Acrolinx setup file to start the installation process. Click Replace to install the latest version of Acrolinx. 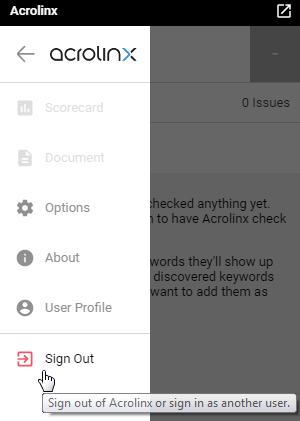 You can uninstall the Acrolinx without affecting your checked documents. This process uninstalls the Acrolinx application from your computer. Open the Applications folder and move the Acrolinx icon to your trash. If you've installed Acrolinx correctly, you should see the Acrolinx icon in your menu bar. You might not see it straight away if your menu bar is already crowded. You might want to reorganize your menu bar so that you can easily get to the Acrolinx status menu. To show the Sidebar, select in the top menu. Where can I change my Acrolinx Server address? Acrolinx checks the content of the text field, but doesn't check the e-mail address fields (to, cc and bcc) and the subject line. Read on if you're the Acrolinx administrator. To use Acrolinx, you need to install VBA on your Mac. VBA (Visual Basic for Applications) is most often installed during the installation of Office for Mac. However, it’s possible that it's not there. In this case, you need install VBA separately. You can use your deployment architecture to distribute preferences like the Acrolinx server address to your users' computers. This is helpful if you want to avoid issues like mistyped server addresses or simply to speed up the working process. You distribute the preferences by first creating the preferences file on your own computer. Then you can push this file to the preferences folder on the users' computers. The technical details of how you distribute this file depend on your individual distribution architecture. In the Finder, go to the ~/Library/Preferences/ folder. If you have set the preferences correctly, you should find the Acrolinx preferences file here. Copy the Acrolinx preferences file, com.acrolinx.Acrolinx.plist . Distribute this file to the ~/Library/Preferences/ folder on your users' computers.